Is the first modern Jin Yong alternate universe drama since The Legend of Brown Sugar Chivalries? Guo Jing (Dong Zijian) is an unassuming but studious doctor from the borders (I’m going to make a wild guess and say it’s Inner Mongolia) who falls for the prettiest and brightest young doctor, Huang Rong (Zhang Jiani). As the two support each other in their journies of self-fulfillment, they’re faced with the opposition of Guo Jing’s boss and Huang Rong’s older sister (Liu Mintao). Li-Chun Lee joins the cast (probably as Hong Qigong?). I know that Kung-fu Hustle paid royalties to Jin Yong for using his characters, but I’m suspicious about the legitimacy of this one and the other modern AU drama, The Legend of Brown Sugar Chivalries. The series is directed by Lu Lunchang (The Master of the House) and scriptwriter is Wang Xiaoqiang (The Mask ). Filming began last week. Despite a large portion its audience using Baidu, The Story of Yanxi Palace 延禧攻略 is the most googled show of the year all over the globe. The tv series was the only Chinese name to make it on any of the lists on Google’s Top Searches of the Year released today. The show has shot to fame its stars Wu Jinyan and Xu Kai, and re-launched the careers of Nie Yuan, Qin Lan, Charmaine Sheh, and most importantly producer Yu Zheng. After a successful online run, it received successful runs on TV in the mainland, Taiwan, and Hong Kong. You can watch the hit show English subbed on Viki and Chinese subbed on Youtube. 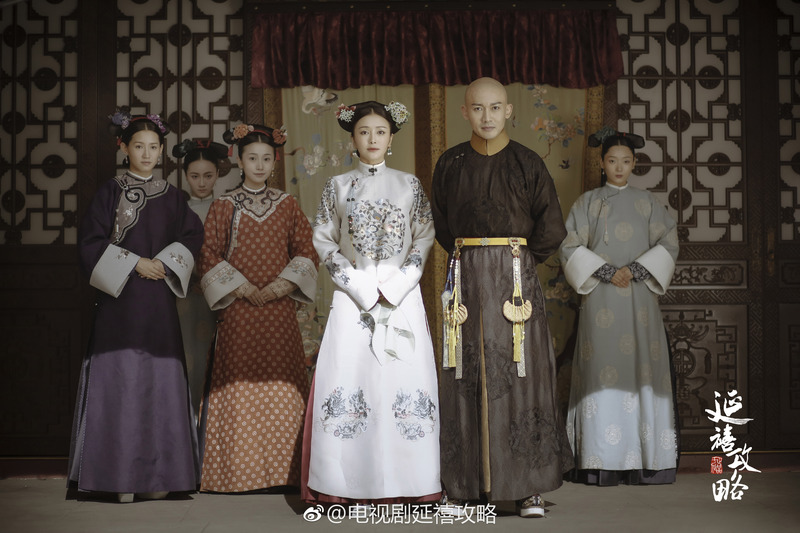 The Story of Yanxi Palace features Consort Ling (Wu Jinyan) as the main character, and revolves around her rise to the top of the harem. 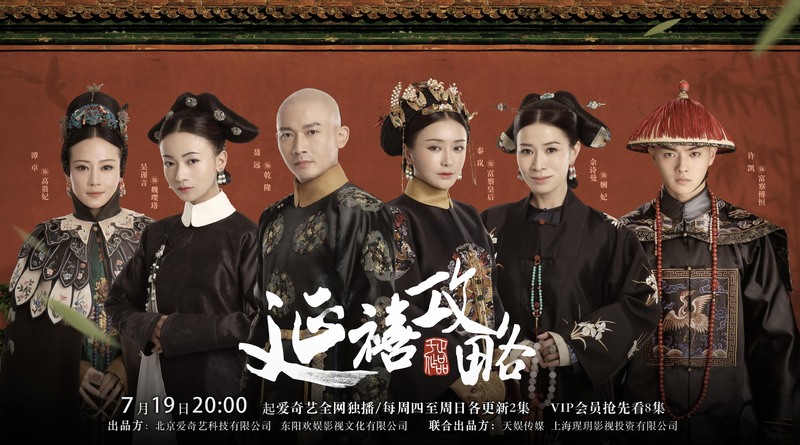 Nie Yuan plays the Qianlong Emperor, and Qin Lan, Charmaine Sheh, Wang Yuanke and Zhang Jiani play the main consorts. The 70 episode drama airs tonight, and will release 2 episodes on iQiyi and Youtube every Thursday to Sunday. VIP members get an 8 episode head start. Update Aug 6th: Thanks to the show’s popularity, iQiyi will now release two episodes every day except Monday. Here to Heart stars Zhang Han and Janine Chang as lovers who can’t forget about each other even after seven years apart. The trailer tells us that Wen Nuan feels partly responsible for her and Nanxian’s father’s death, which prompts her to break up with Zhan Nanxian (again). Mix in a meddling future mother-in-law, an older sister/love rival (Zhou Qiqi) and an interfering second female lead (Zhang Jiani), and you’ve got yourself a 46 episode melodrama. Here to Heart premieres tomorrow night. Here to Heart is an upcoming romance drama starring Janine Chang (The Advisors Alliance) and Zhang Han (Wolf Warrior 2), who replaced original male lead Huang Xiaoming after he backed out to film The Years You Were Late. First it was Gong vs. Bu Bu Jing Xin, then Gong II vs. Legend of Zhen Huan, and now this time it’s Yanxi Gonglue vs. Ruyi’s Royal Love in the Palace. Yu Zheng may have toned down on the bright colours, but his lawsuit with Qiong Yao doesn’t seem to have killed off his bad habits of plagiarism. Ode to Gallantry has released more stills. Starring Cai Yida, Zhang Jiani, Li Zixiong, Xu Shaoqiang, Liu Ximing, and Ma Ling, I guess there are still plenty of dramas that are sitting waiting on the shelf. Zhang Jizhong‘s Ode to Gallantry has released even more stills. Starring Cai Yida, Zhang Jiani, Li Zixiong, Xu Shaoqiang, Liu Ximing, and Ma Ling, more for those looking forward to Zhang Jizhong’s comeback. See! It’s not THAT bad!! There’s plenty of pretty HERE!! Ode to Gallantry has released more stills. Starring Cai Yida, Zhang Jiani, Li Zixiong, Xu Shaoqiang, Liu Ximing, and Ma Ling, those who miss Zhang Jizhong’s touch to the wuxia genre can probably look forward to this.